You know what's interesting about PowerPoint presentations? Usually nothing. What began as a wonderful tool for publicly conveying information has transformed into the ultimate crutch for the underprepared and verbose. Too much text is the enemy, and effective presenters know it. 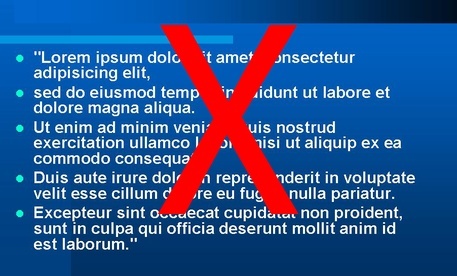 The typical PowerPoint slide has forty words. It was nearly impossible to find forty words on ten slides of the Amazon presentation. Bezos told the story behind the new products in images and text. I’ve discussed this technique before in more detail but in short, it’s called Picture Superiority. It simply means that the brain processes information more effectively when the information is presented in pictures and words instead of words alone. Neuroscientists have also found that when a slide (or advertisement) contains pictures and words, it’s best to have the picture on the left side of the page or slide and words on the right. This is exactly what Bezos did for a majority of his slides. Gallo advises you ditch wordy bullet points, focusing instead on visual representations of your information (pictures, graphs and video). Use images to emphasize your text and use text sparingly. The amount of words on screen is usually inversely proportional to how much the audience is listening to what you say. The purest form of this style is the PechaKucha, a style of presentation in which 20 slides are shown for 20 seconds each, keeping presentations fluid and at around six minutes and 40 seconds total. There are some wonderful examples around the web. Let me be clear—picture superiority works in any presentation, even for the most complex ideas...I am recommending that you ditch PowerPoint as we know it—dull, wordy, and overloaded with bullet points. Image-rich presentations work effectively because pictures appeal to the right hemisphere of the brain—the emotional side. You can have great ideas backed up by data and logic, but if you don’t connect with people emotionally, it doesn’t matter. What techniques do you use to create memorable presentations?